Have you heard? 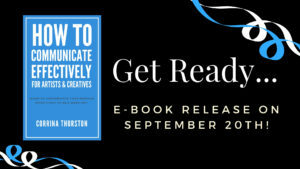 This Thursday, September 20th, my newest book, How To Communicate Effectively – For Artists & Creatives, is being published and will be available as an e-book! The reviews and feedback are rolling in from the advanced readers who were able to get a preview copy of the e-book, and I couldn’t be more excited! People are loving this book. “Love, love, loved this book! Great follow-up to the first one. I learned so many things about communication that I am still digesting it all and trying to use it on my social media and website. Lots of info and common sense ideas on how to communicate on every level. Corrina’s writing is comfortable to read. She has a method of writing/speaking that is pleasant and not intimidating and I admit that makes a big difference to me when I read her writing and have heard her give a speech. I can’t wait for the other two books. I read excerpts of them in the back and was immediately focused and interested. “When I read Corrina’s words I feel as if she is speaking directly to me. It’s like having my own personal art business coach. Thank you, Corrina. I look forward to reading more from you! I can’t WAIT to release this book on Thursday! 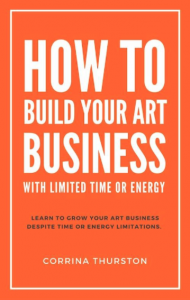 But before that happens, I want to give you a chance to win a PAPERBACK copy of my FIRST book, How To Build Your Art Business: With Limited Time or Energy! Join this Facebook event page for the online celebration of the release of my newest book and you’ll see instructions for how you could enter to win a free paperback copy of my FIRST book. “I just finished reading Corrina Thurston’s book HOW TO BUILD YOUR ART BUSINESS WITH LIMITED TIME OR ENERGY for the second time and I can honestly say that my life would be very different now if I’d had this manual to build an art career in my 20’s! That being said, in the spirit of “never too late,” I will be implementing the many guidelines and pointers she has laid out so plainly in this very smart guide. That Corrina was able to build a successful art career, essentially from zero (starting to draw from her sickbed to keep busy) to creating quality art, exhibitions, writing and getting grants, collaborations and more is inspirational. So join the event page HERE, learn some behind the scenes info about the upcoming book, ask me questions, and get your name in the drawing for a free book! PLUS, it’s not just any free copy… it’s going to be a SIGNED, NUMBERED copy, guaranteed to be one of the FIRST 100 copies published! But hurry! Contest ends at midnight on September 19th, 2018 and the winner will be announced on the event page on the Launch Day of September 20th!